tis the second of the city markets, which is the administrative center of the city. From the main square, called Markt, the Breidelstraat street leads here. The square is surrounded on three sides by buildings. We can admire the Basilica of St. 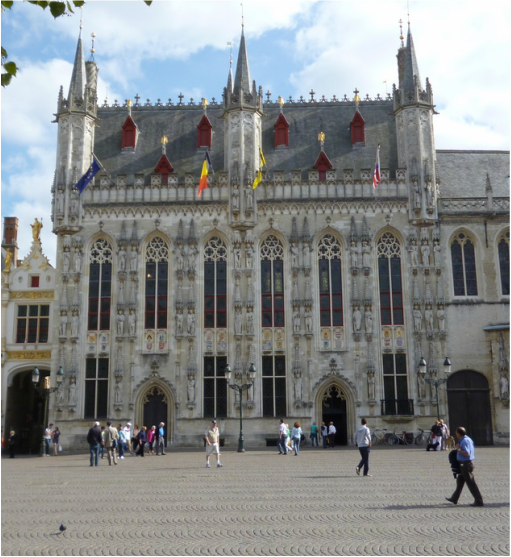 Blood (Heilig Bloed Basiliek), which bears its name from kept, in the silver tabernacle, the relics of the blood of Christ, which came here between 1150 and 1200. The basilica consists of two chapels. The first Romanesque comes from the twelfth century. Higher, rebuilt in the Gothic style, from the fifteenth century. 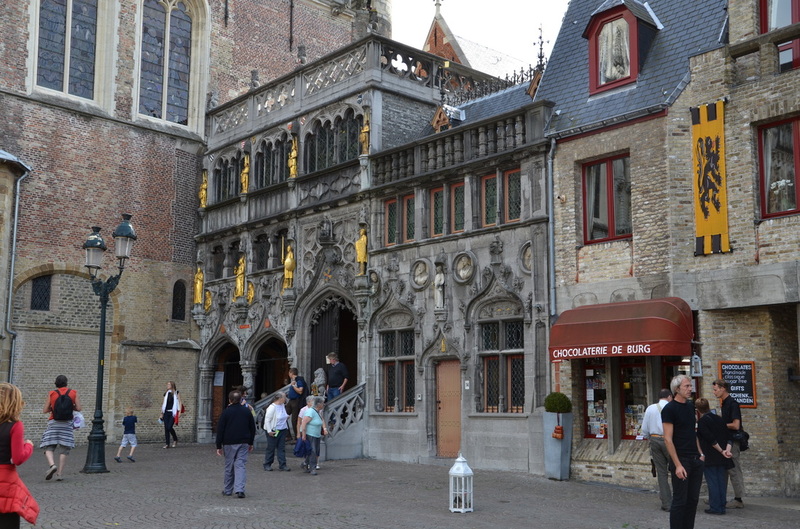 To the left of the basilica stands the town hall, the oldest preserved in Flanders. 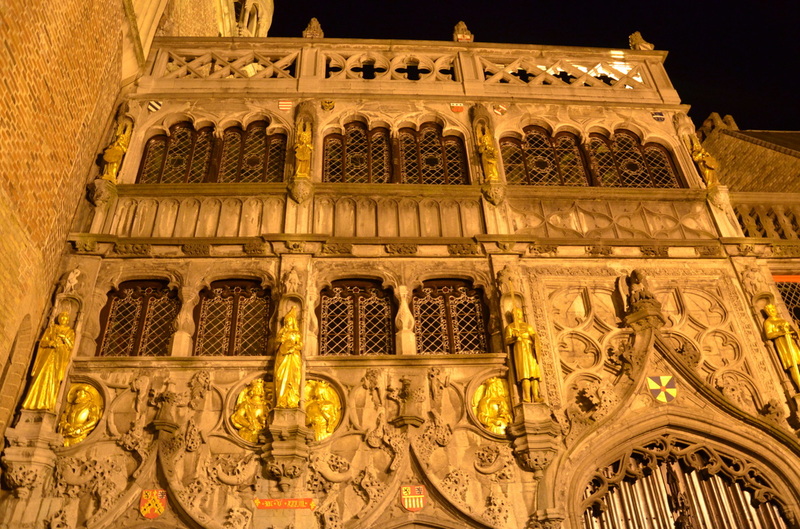 It was created in 1376 a year and became a model for town halls created in other cities. The façade has six pointed arched windows and 48 sculptures. Original statues depicting biblical characters and Flemish princes were destroyed in 1712 year. The first meeting in the town hall took place in the 1464 year. Both inside and outside the town hall was rebuilt. In the rooms on the ground floor are paintings depicting important people and events historically, such as the death of Charles the Brave, the fatal fall Mary of Burgundy. A monumental staircase leads to the first floor, to the Gothic Hall (Gotische Zaal). The ceiling of the chamber is enriched by the original gold-plated ornaments. The paintings painted on the walls are the works of brothers Albert and Julian De Vriendt (1895). They illustrate important moments in the history of Bruges. The largest scene depicts The Battle of Golden Spurs from 1302 year and the desired victory over the French. It delights with a magnificent neo-Gothic fireplace created by de Wispelaere. A bronze statue depicting the patron of the city of Saint Donatus and the sculpture of Ludwik van Maele, Count of Flanders, are two masterpieces by J. Anthone. A modest collection, consisting of antique chests of urban treasures, old maps, and navigation devices, were gathered in the historical room. 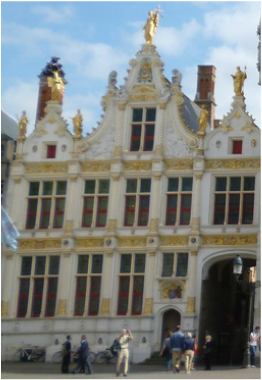 Next to the town hall is Oude Griffie, a former municipal archive (closed to visitors) built in 1537 year. Its elegant, bright façade is decorated with Renaissance columns and friezes, covering the gothic lines of the peaks. 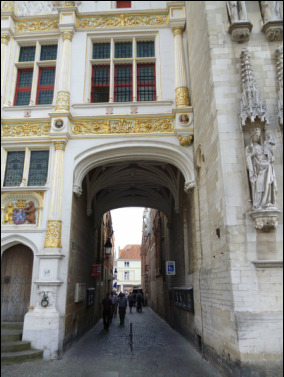 The archive building is a beautiful baroque gate leading to the street Blind donkey. This charming alley took its name from the old tavern. The gate was one of four that used to be used to get to the Burg square. Neighboring to Oude Griffie Palais van Brugse Vrije, or the Freedom Palace of Bruges, looks quite modest from the outside. 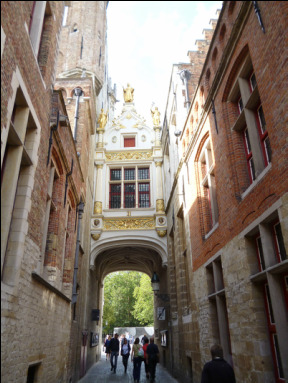 What attracts crowds of tourists to it is undoubtedly the Renaissance Freedom Hall of Bruges, the only fragment of the 15th-century palace. There is a 16th-century fireplace designed by Lancelot Blondeel. It was built in the years 1528-1581 from oak wood, alabaster and marble, to celebrate the victory at Pavia over the French king Francis I. It is an outstanding example of Renaissance sculptural art. Opposite the town hall is the only place where there is no building. From this side, Burg Square is open. Until the year 1799 stood here the largest church in Bruges, the Cathedral of St. Donatus, which was destroyed during the French Revolution.